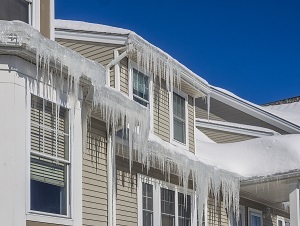 One of the most common and potentially serious problems are ice dams, those large ridges of ice that form at the edge of the roof on many houses. First of all, if you have ice dams, you don’t have a roof problem; you have a heat problem. Ice dams form when heat from inside the home rises through the ceiling into the attic and warms the surface of the roof. Snow on the heated part of the roof melts and flows down until it reaches the cold edge of the roof, where it re-freezes and creates an ice dam. As the snow above keeps melting, the ice dam keeps growing, and the water held back by the dam can eventually seep into cracks in your roof covering, into your attic, and into your ceiling and walls. Once inside the house, that water can collapse ceilings, permanently damage insulation, cause mold inside wall cavities, buckle hardwood floors, and wreak havoc in other ways. And any one of those scenarios can create a costly mess. So what happens then? Can you file an insurance claim for this kind of damage? Here are a few things to know about ice dam coverage. Will homeowners’ insurance cover this damage? Generally, yes. Most standard homeowners’ policies cover ice dam damage, including water damage and damage to personal property. Exactly what is covered depends on your insurance company and your policy. Just beware – if the damage is the result of your own failure to properly maintain your home, such as not fixing a leaky roof you’ve known about for years, your claim could be denied. Does homeowners’ insurance cover removal of ice dams? Your insurance won’t likely pay to have ice dams removed as a preventative measure. That’s your responsibility as a homeowner. When is the right time to file a claim for ice dam damage? Get an estimate of the damage and consider the amount of your insurance deductible before filing a claim. If the damage amounts to $800 and your deductible is $1,000, it’s probably not worth it. Will homeowners’ insurance pay for a new roof due to damage from an ice dam? No. As noted above, ice dams are caused by a heat and insulation issue, not a roof issue. Avoiding ice dams altogether is the best solution, and a little routine maintenance can go a long way in preventing them. It is recommended to keep snow removed from roof eaves. This can typically be accomplished with a snow roof rake, but be careful not to damage shingles. If you can’t do the job safely on your own, it is recommended to hire a professional. Often, adding more attic insulation will assist in keeping the warmer air away from the roof interior, resulting in ice dam prevention. For more tips on protecting your home against winter’s wrath, contact the homeowners insurance professionals at BNC today.